Tonight is a double feature if you live in the Sheridan Park community. First, there is the bimonthly CAPS meeting at 6:30pm. Beat 1913 covers the area bordered by Broadway, Montrose, Clark, and Lawrence. The theme this meeting is "Street Safety/Robberies," but there's sure to be a lot of discussion of the drug bust that took place last week. The next meeting isn't until September, so be sure to attend tonight if you want to discuss crime in Sheridan Park with your local officers. The meeting takes place at Courtenay School, 4420 Beacon Street. 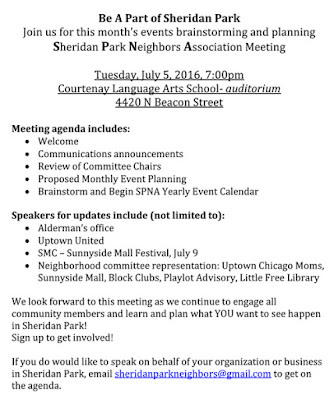 Following CAPS, Sheridan Park Neighbors Association will hold its meeting in the Courtenay School auditorium. 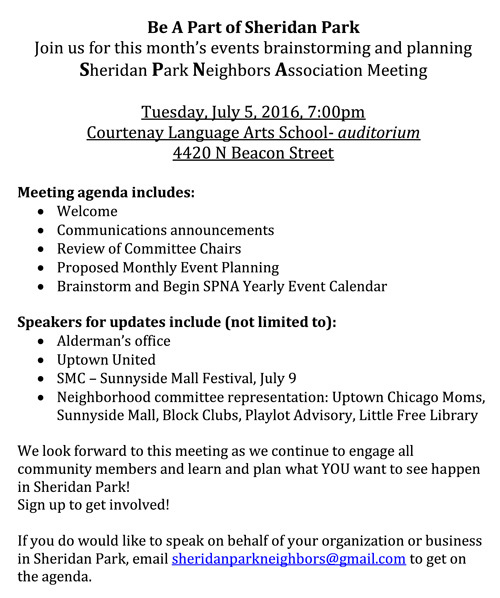 SPNA is an umbrella organization for the various Sheridan Park block clubs. The meeting agenda is above.